Counties covered: Nottinghamshire, Yorkshire, Durham, Lancashire and Northumberland. Deer species present: roe, red, fallow, sika, muntjac. 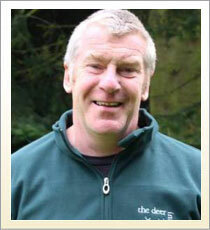 Co-ordinated by Alastair Boston, the North West England Deer Project developed out of the Cumbria Deer Project, originally launched in March 2008 as a partnership between Natural England, the Forestry Commission, Cumbria Woodlands and the Deer Initiative. The project was set up to address the high levels of deer browsing that were damaging over 325 ha of Sites of Special Scientific Interest (f which over 275ha are woodland) mainly in the south of Cumbria. The objective has been to improve the condition of these special woodlands but working on a landscape scale to benefit all the woodlands and other habitats in the surrounding areas. The project advocates, supports and co-ordinates sustainable deer management while promoting venison within local food initiatives. From April 2010 the project was expanded to cover all of Cumbria and Lancashire. There is evidence of success in reducing deer impacts in protected woodlands in Cumbria and Lancashire. In the Rusland Valley for example, with good support from local landowners we have supported a landscape-scale, co-ordinated approach to deer management. The Lake District National Park Authority and some of the private woodland owners are already seeing an increase in natural regeneration. Alastair is also the Deer Initiative national lead on anti poaching activities, working with enforcement bodies, the National Wildlife Crime Unit and the Partnership against Wildlife Crime among others.